Is Tesla Working on a Flying Version of the Roadster? 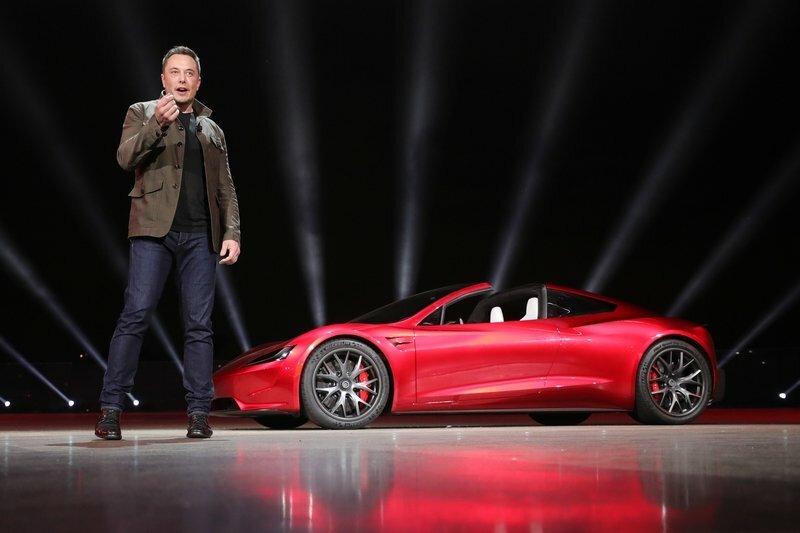 Elon Musk says it’s "certainly possible"
Tesla just unveiled the next-generation Roadster and the preliminary (still theoretical) performance figures are downright shocking. 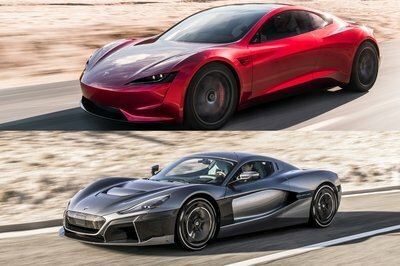 From 0 to 60 mph in 1.9 seconds and a top speed of over 250 mph to a range of at least 600 miles, the second-generation Roadster will move the electric car (and the entire automobile industry for that matter) into a whole new era. Assuming it will live up Elon Musk’s claims, that is! But things got even more interested over the weekend when Musk tweeted that the crazy numbers above are for the base model, with an upgrade to take things up a notch. "Should clarify that this is the base model performance. There will be a special option package that takes it to the next level," he said. Holy molly. What does that even mean? 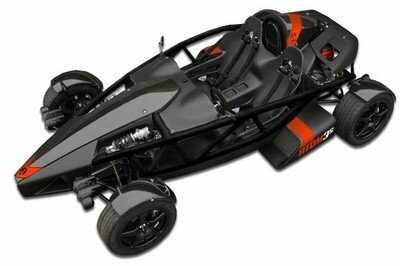 Will the Roadster get even quicker that 1.9 seconds to 60 mph? 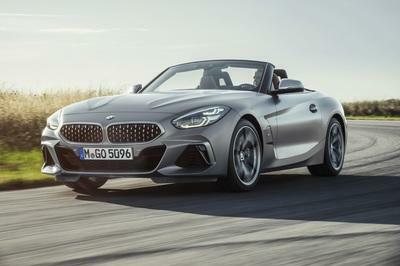 Will the range increase to 700 or 800 miles on a single charge? Are we getting some sort of track-spec model? Is Elon Musk on drugs or something? But wait, there’s more. 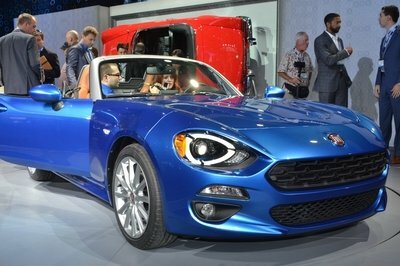 On Sunday, Must tweeted again, now saying that the special performance upgrade could enable the Roadster to fly "short hops." 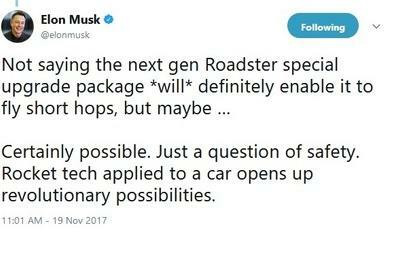 I kid you not; these are his words: "Not saying the next-gen Roadster special upgrade package *will* definitely enable it to fly short hops, but maybe... Certainly possible. Just a question of safety. Rocket tech applied to a car opens up revolutionary possibilities." Is Musk Serious about This? SpaceX Tech for the Roadster? Before you cue the "I’d like some of whatever he’s smoking" jokes, you should know that Musk is also CEO of SpaceX. An aerospace manufacturer and space transport services company established in 2002, SpaceX has many achievements to brag about, including creating the first privately funded liquid-propellant rocket to reach orbit. It was also the first privately funded company to successfully launch, orbit, and recover a spacecraft, and the first private company to send a spacecraft to the International Space Station. It has already flown ten missions to the International Space Station and is currently developing a shuttle that would be used by NASA to transport astronauts to the ISS and back. So needless to say, Musk has access to the "rocket tech" he mentioned. And he already borrowed SpaceX technology for the Model S. But is he serious or just trying to max up the hype around the Roadster? 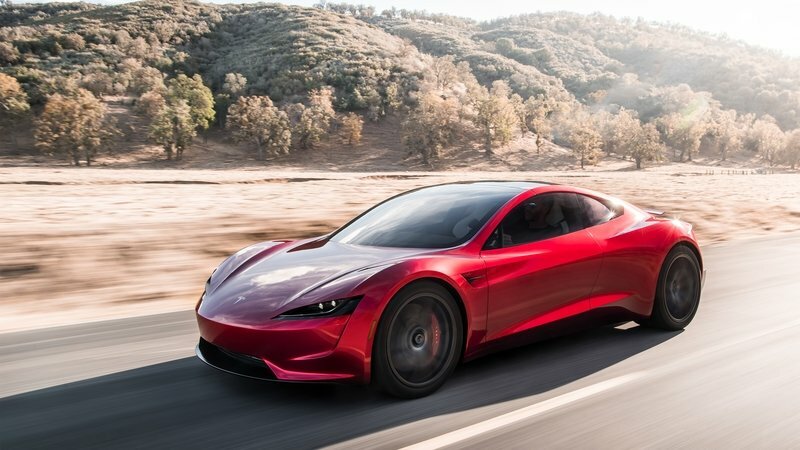 Tesla is already struggling with financial losses — some say the company won’t be able to launch the Roadster and the Semi as soon as it claims — and such a project would create additional strain. Maybe Musk is willing to sacrifice the pinch of stability Tesla has right now for one final shot at glory?